Zongkar Choede Monastery is historically one of the oldest monasteries in Tibet. Is was established in western Tibet, Mang-yul upper Gung- Thang region, in 1270 by the Tibetan king Tri-bum-de-gon, who was the last great scion of Tibet’s royal descendants. The king built the monastery facing opposite to his palace phodang khunzong karpo (The white Nest of Eagles) The monastery, through the time, became a thriving spiritual community in western Tibet and also became a focal point of Tibetan civilization. Over the time it emerged as one of the largest repositories of Tibetan folk and monastic art, music, dance, artifacts and spiritual training. There existed upper and lower Zongkar Choede within the same wall, each having over 300 monks. The inmates followed Buddhist studies, meditative practices and tantric ritual arts. Hundreds of highly realized monks dedicated their lives for the continuation of the monastery to date. In the tumultuous decade that followed between 1950-1959, the peaceful land, its people and all their way of life fell under the communist Chinese. The destruction reached its climax during the cultural revolution, which made Tibet native values and institutions the target of its fury. Dzongkar Choede Monastery was razed to the ground and monks had to escape. Of the original 600 monks of the monastic community of Zongkar Choede before the destruction, less than 5 % survived to tell the tale. A decade and a half elapsed in this historical twilight to alive in exile. Reconstruction began in the lush green forests and farmlands of coastal South India near the Arabian Sea in 1972 under the auspices of His Holiness the Dalai Lama and the Government of India. Mud and bamboo thatches became living quarters, community kitchens and prayer halls for the new Zongkar Choede in exile. Today Dzongkar Choede is a monastic community of 305 monks. It is an active cultural center open to everyone. At the core of its monastic study programs are Zongkar Choede’s unique heritage: Tibetan monastic chanting, ancient Tibetan monastic ritual mask-dance, art of butter sculpture, sand mandala, for which the monastery is renowned throughout Tibet and the world. The monks also study Buddhist logic and debate following Sera Jeh monastic university text. The monastery also runs a small school for the young monks providing modern education. There is also a small traditional Tibetan thangka painting class and traditional incense-making center to preserve and promote Traditional Tibetan art and also offer job opportunity to young unemployed Tibetans. 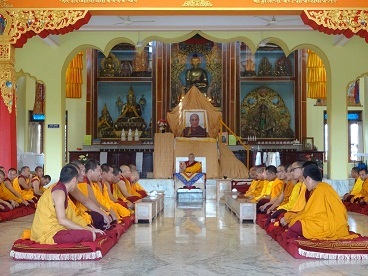 The monastery is fully dependent on devotees’ offering and sponsorship program for its young monks. It has not received any financial support/assistance from the state and government.